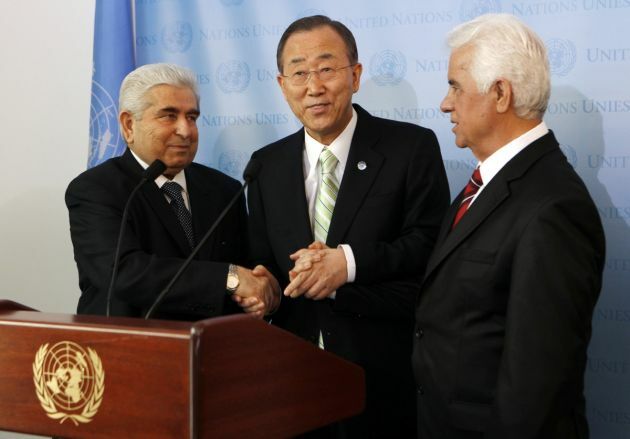 (REUTERS/Mike Segar)United Nations Secretary-General Ban Ki-moon (C) joins hands with Greek Cypriot leader Dimitris Christofias (L) and his Turkish Cypriot counterpart Dervis Eroglu (R) following their meetings at United Nations headquarters in New York, January 25, 2012. GENEVA – The United Nations independent expert on freedom of religion or belief has hailed a key breakthrough in inter-faith communication reached by religious leaders on the divided island of Cyprus. The agreement allowed Muslim and Greek Orthodox religious leaders to cross the Green Line dividing the island. ""I am very pleased about the recent positive developments and improved climate of interreligious communication in Cyprus. "I consider it a breakthrough for religious freedom on the whole island." the Special Rapporteur on freedom of religion or belief for the United National, Heiner Bielefeldt said. 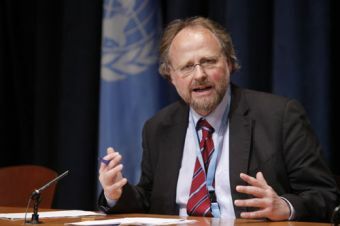 (UN Photo / Paulo Filgueiras)U.N. Special Rapporteur on freedom of religion or belief Heiner Bielefeldt in October 2013. "While the Cyprus conflict is not per se a religious conflict, all cooperation between the religious leaders had stopped when the bi-communal conflict between Greek Cypriots and Turkish Cypriots escalated 50 years ago," he noted in a statement on October 22. The Green Line is a United Nations Buffer Zone in Cyprus. It is a demilitarised zone patrolled by the United Nations Peacekeeping Force in Cyprus. It was established in 1974 following the Turkish invasion of Cyprus, and it partitions the island into the area controlled by the Government of Cyprus. The U.N. drew up the Green Line as a ceasefire demarcation line in 1963 after intervening to end communal tension and it became impassable after the 1974 Turkish invasion, except for designated crossing points. A member of the European Union, Cyprus officially controls the island except for British Sovereign Base Areas in the South and that under the administration of the Turkish Republic of Northern Cyprus in the North. The Turkish Republic of North Cyprus is officially recognized internationally only by Turkey, which occupied the northern third of the island of Cyprus in 1974, still having a large military presence there. "These may seem like small steps, but they constitute a huge leap for the religious communities concerned," Bielefeldt said. On October 18, the Grand Mufti of Cyprus, Dr. Talip Atalay, crossed the green line and held service at Hala Sultan Mosque near Larnaca for the first time. This was possible due to an agreement reached with the Greek Orthodox Archbishop Chrysostomos II, who personally facilitated Dr. Atalay's access to the areas controlled by the Republic of Cyprus government. Two days earlier, Bishop Christoforos of Karpasia, who had been prevented for the previous 18 months from visiting the northern part of Cyprus and his diocese, was allowed to visit and worship at the monastery Apostolos Andreas on the Karpass peninsula in the north-east of Cyprus. The United Nations has been facilitating talks between the Greek Cypriot and Turkish Cypriot leadership. It has its eyes on the eventual establishment of a federal government with a single international personality, consisting of a Turkish Cypriot Constituent State and a Greek Cypriot Constituent State, each of equal status. Bielefeldt praised the religious leaders during a video conference concerning the new significant steps they made towards improving freedom of religion or belief on the whole island. He also encouraged them to create an inclusive institutional framework to promote ongoing communication, such as an Interreligious Council for Peace in Cyprus. On September 12, Bielefeldt took part in the first Interreligious roundtable held in Cyprus, organised by the Office of the Religious Track of the Cyprus Peace Process, under the auspices of the Embassy of Sweden, and in cooperation with the Office of the UN High Commissioner for Human Rights. "Such cooperation on the whole island creates a fertile ground for addressing the underlying human rights issues, which could also have a positive impact on the reconciliation process as a whole," he said. These efforts follow-up to the Special Rapporteur's recommendations in his 2013 report to the UN Human Rights Council, in which he stressed the importance of ensuring that there are no human rights protection gaps and that all persons can effectively enjoy their fundamental rights, including freedom of religion or belief, wherever they live.